Be Brave tackles workplace numeracy, helping students understand percentages and other equations applicable to the workplace. However, it does so much more than that – building confidence, tackling bullying head on, helping people learn to speak out, and changing attitudes. At Griffins, this has had an enormous impact on the company, individuals, and their families. Let’s hear Jackie’s story. Jackie’s certainly not someone who runs from a challenge – the outgoing, enthusiastic clicklock machine operator was, by her own accounts, the ‘guinea pig’ for Be Brave, working one-on-one with Hazel before the programme started to help Upskills determine how the project needed to look at Griffins before doing Be Brave herself. Before working at Griffins, Jackie was helping South Auckland whanau from rough backgrounds through Te Whakaora Tangata. A partnership was made between Te Whakaora Tangata and Griffins – and Jackie ended up working for Griffins. She’s taken her passion for helping people through to her job with Griffins and into (and out of!) the Be Brave programme. Jackie threw herself into the Be Brave programme, focusing on a project that would improve communication between Griffins’ people on the factory floor and leadership, as well as the culture within the factory teams. “The more people that go through this programme and do it, the better it’s going to become in this plant. Personally, she’s already seen it impact hugely on her role operating the clicklock machine. “I’ve not been too keen on maths from the get go – maths is a weakness – but the equations we had to do and the explanation that Lynn gave me made it more fun,” says Jackie about the workplace numeracy skills she’s gained on the programme. As for her role as a health and safety rep, Be Brave has given her the courage to speak up, and speak out. “I’ve always been confident, but circumstances that I have faced can kill that confidence. What Be Brave has done for me is exactly that – I feel brave to be able to say something. Now, Jackie’s busy telling everyone she comes across to jump on board and take advantage of the programme. 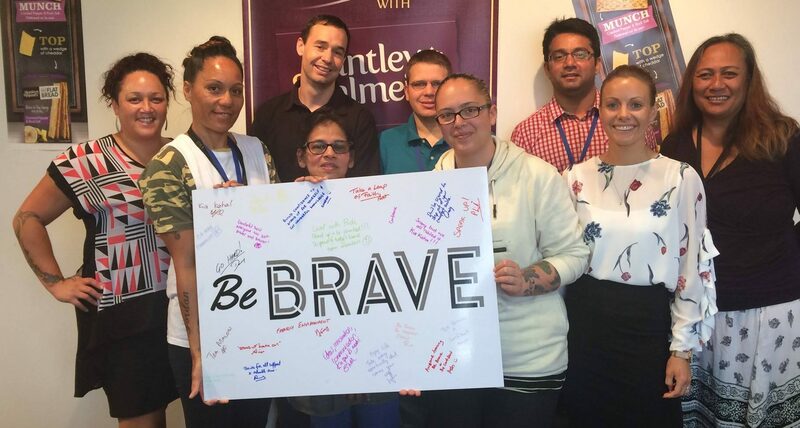 “I’ve been vocal in the smoko room about the Be Brave programme – I truly believe that this programme would benefit every worker in this plant. It’s given us the opportunity to see what comes next. If you want to excel, you’ve got to put yourself out there.